A hearing today on the confirmation of Justice Andrew J. McDonald as chief justice of the Connecticut Supreme Court comes as politicians, lawyers and advocates debate the question of how ideology and partisanship should be balanced against questions of intellect, competence and integrity in evaluating fitness for the bench. The nomination of McDonald, an old friend and political ally of an unpopular governor now seeking to promote him, pushes more buttons than most. As a Democratic state senator, McDonald was unabashedly liberal, a proponent of gay marriage and abortion rights, drawing fire from the Catholic Church. As a justice, he voted to repeal the last vestiges of capital punishment. McDonald, 51, also is a trailblazer for the LGBT community as the first openly gay justice on the state’s highest court, a factor that opponents say is irrelevant and supporters say is impossible to ignore. His sexual orientation has been central to an anonymous hate campaign waged in the wild west of political discourse, the internet. His ascension would be difficult to separate from the legacy of Gov. 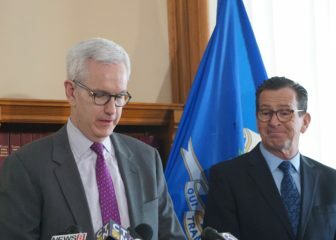 Dannel P. Malloy, a Democrat all but guaranteed to leave office next January having appointed six of the seven justices on Connecticut’s highest court. A Republican candidate for governor, Tim Herbst, has tried to make blocking McDonald’s confirmation a campaign issue. The confirmations of Justices Maria Araujo Kahn and Raheem Mullins, who took their seats on the court last fall when the legislature was not in session, also are up for hearings today. Both are judges Malloy appointed to the Appellate Court and promoted to the Supreme Court. McDonald would succeed Chase T. Rogers, who stepped down earlier this month after 10 years as chief justice. If confirmed as chief, McDonald’s promotion would open a vacant associate justice position, giving Malloy one last appointment to the court. The highly charged and polarized nature of U.S. politics in general and McDonald’s confirmation in particular prompted nearly four dozen members of the bar to write to legislators “to express concern about what some perceive as a dangerous trend” of assessing judicial nominees through the lens of partisan politics. The fact it was written spoke more loudly than its relatively bland content: The lawyers acknowledged the right of any legislator to scrutinize the decisions of any judge or justice coming before them for confirmation, while urging them to be mindful of the critical value of an independent judiciary in a democracy. The context for the letter is broader than Connecticut, coming in an era when President Trump has leveled unprecedented criticism at the courts, calling the U.S. justice system “broken,” “a joke” and “a laughingstock,” and demeaning individual judges, including the jurist presiding over a lawsuit against Trump University. Legislators in several states have threatened retribution against judges over unfavorable rulings, ranging from pay cuts in Iowa over firearms to impeachments in Pennsylvania over a gerrymandering case. Last year, the Connecticut Senate came close to blocking the reappointment of Justice Richard N. Palmer to his fourth and final term on the court. He reaches the retirement age of 70 in 27 months. He was confirmed on a vote of 19-16, with 15 Republicans and one Democrat in opposition. Palmer was appointed in 1993 by Lowell P. Weicker Jr., an independent, and reappointed by Republicans John G. Rowland and M. Jodi Rell and a Democrat, Malloy. 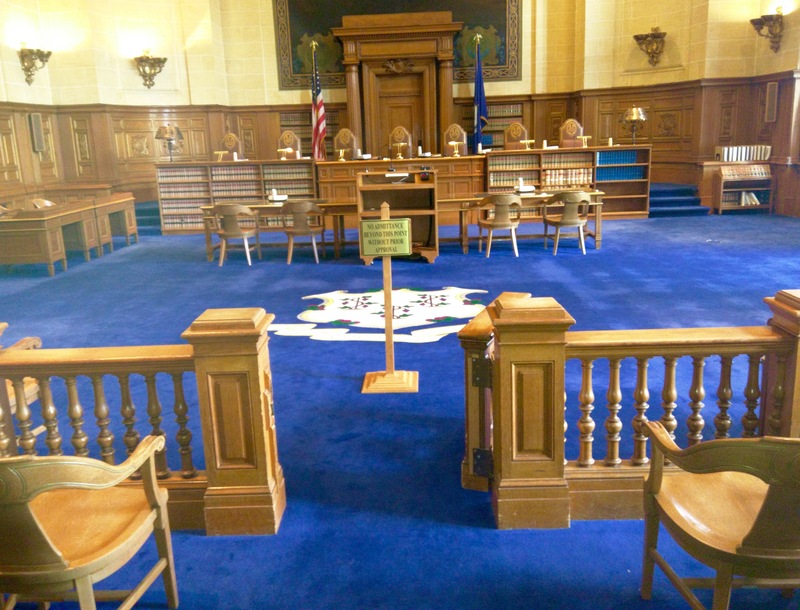 While judges are elected in many states, judges of the Superior, Appellate and Supreme courts in Connecticut are nominated by the governor to eight-year terms, subject to confirmation by the General Assembly. Governors can make their nominations for initial or subsequent terms only from a list of candidates approved by the Judicial Selection Commission, a panel of lawyers and lay persons appointed by the governor and legislative leaders. By law, the Judicial Selection Commission must consider the reappointments of judges with a presumption they are qualified. There is no such presumption limiting a governor or legislators, just a tradition of returning judges to the bench until age 70, absent cause. Ross Garber, a former member of the Judicial Selection Commission who was counsel to Rowland and Rell, said Connecticut’s system gives judges a healthy distance from politics. Legislators confirmed McDonald, who now is the longest-serving current justice after Palmer, to the high court five years ago by lopsided votes of 30-3 in the Senate and 125-20 in the House. One of the three senators to oppose him, Republican Joe Markley of Southington, noted during the debate there is little guidance for lawmakers in assessing judicial nominees. Sen. Paul Doyle, D-Wethersfield, a co-chair of the Judiciary Committee, said it is fair game for lawmakers to quiz jurists on their decisions, so long as the questions pertain to cases that are closed. Opposition to Palmer centered on the majority opinion he wrote in a 4-3 decision striking down the death penalty, as well as his unusually sharp exchanges with another justice, Carmen E. Espinosa, in an appeal of a murder conviction. McDonald was part of the 4-3 majority in the death penalty case, which reviewed a 2012 law that eliminated capital punishment for future crimes, while leaving intact the sentences of 11 men already on death row. The court set those sentences aside. Doyle disagreed with the death penalty decision, but he voted for Palmer’s confirmation last year. “As long as it’s intellectually reasoned, that’s not ground in my mind to vote against a justice,” he said. 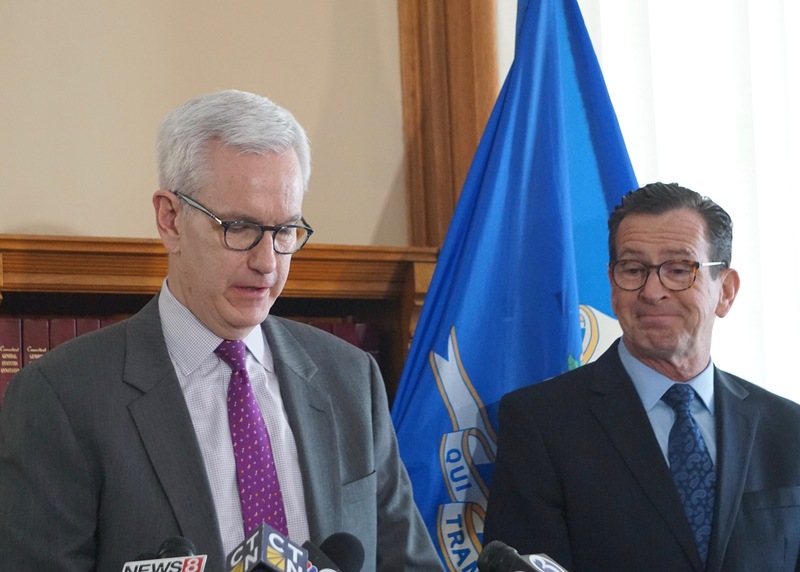 McDonald, who was an influential legal voice as co-chair of the legislature’s Judiciary Committee during his eight years in the Senate, resigned from the legislature to become the top legal adviser to Malloy during his first two years as governor. An issue in his original confirmation was his sponsorship of a bill in 2009 that Catholics deemed an intrusion into church affairs. It would have made changes in the state’s religious corporations act, which governs the corporate structure of several denominations. Connecticut’s Catholic bishops have not joined the effort. A gun group suspicious of McDonald’s leanings in favor of gun controls filed a freedom of information request with the courts, demanding copies of any communication McDonald may have had with the Malloy administration during the debate and passage of a gun-control law after the Sandy Hook massacre. The courts replied that no such documents existed. Sen. John A. Kissel, R-Enfield, a co-chair of Judiciary, said he is not afraid of the debate over where the line falls between a legislature exercising appropriate oversight in judicial confirmations and undermining judicial independence. A supporter of capital punishment, Kissel still voted for Palmer last year and McDonald five years ago. There is nothing wrong with legislators asking sharp questions, he said.